Wisdom tooth removal – they are the most common teeth to become impacted or positioned sideways and often have the most problems coming through safely and easily. Often this is due to a lack of space in the back of the mouth. They don’t live up to their name of being wise. 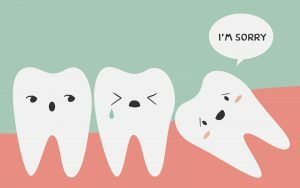 Wisdom teeth are the third set of molars, developing and coming through sometimes in late teens and early twenties for most people. Historically diets consisted of course grains, seeds and nuts which wore down teeth and created tooth loss, so a third set of molars was required. With improved preventive dental care and a softer modern diet our teeth do not wear and therefore we have a complete set of healthy teeth often not requiring the addition of wisdom teeth. When do we recommend wisdom tooth removal? Wisdom tooth removal is recommended when the teeth are impacted and have insufficient space to erupt through the gums in a straight upright position which is easily cleaned. If the teeth are left in a sideways or remain partially submerged beneath the gums often food and plaque collects under the gums leading to painful swelling, inflammation and infection of the gums surrounding the wisdom tooth, decay of the wisdom tooth and can cause decay of the tooth in front, the second molar. Wisdom teeth if often recommended following orthodontic treatment as well to reduce the risk of re-crowding of teeth following braces or Invisalign. Is the wisdom tooth removal process difficult? Wisdom teeth require thorough assessment by your dentist with visual examination and xray radiographs to assess the number, position and development stage of the wisdom teeth. Ideally if the teeth require removal, the removal should be done prior to full development of the roots and hooking around nerves, blood vessels and sinuses. If the wisdom teeth are through in the mouth, straight and have uncomplicated roots, they can be removed very simply. If the wisdom teeth are impacted or buried beneath the gums they often require surgery to remove the tooth. This can be done in the dental chair with local anaesthetic and happy gas with a general dentist, or under general anaesthetic while you are asleep with a dental specialist. Often there is some minor discomfort and swelling following the procedure, and your dentist will let you know how long that would be expected to last for your mouth. Dr Kate Collins has a lot of experience removing wisdom teeth and really enjoys making it a straight forward and stress free experience for patients.